The “Infectious Diseases Twitter Highlights” column presents recent twitter posts that are of particular interest to the infectious diseases community and provides commentary. Commentary: An interesting, but short paper reviewing the 13 identified studies that compared serum to cerebral spinal fluid vancomycin concentrations. The ratios ranged from 0.00 to 0.81, and varied depending on the infection that was being treated. Regardless of this reported variability in concentrations, 83% of meningitis and 100% of ventriculitis patients achieved a cure. No factor could predict the penetration rate of vancomycin into the CSF. An interesting data point (and one that tells us that even with variable penetration), is that the current dosing schemes used for CNS infections are working. 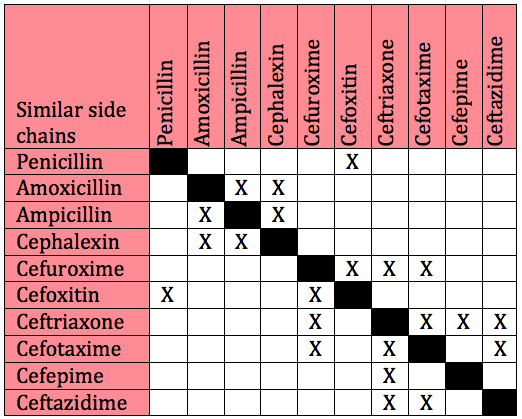 Commentary: An excellent review of the data we have on cross-reactivity between penicillins and cephalosporins, and most importantly a good table that shows which ones have similar side chains to each other. This is an important resource for management of penicillin allergies, and while the article stresses we do not know the actual rate of cross-reactivity, a safe measure is to avoid agents with similar side chains. For me, the highlight of this article is the chart, and I will be putting it into my personal toolbox. Commentary: Infectious Diseases physician Dr. Paul Sax provides an excellent overview of the new fluoroquinolone delafloxacin (Baxdela), which was approved in June 2017 by the FDA for acute bacterial skin and skin structure infections (ABSSSI). He does a nice job outlining the key pros and cons of the drug and provides a little history on the class. Key pros include the spectrum of activity (MRSA and Pseudomonas!) and anionic properties, which may allow for increased accumulation in bacteria. Key cons/concerns include development of resistance and class adverse effects/warnings. As he points out, we do not need another skin drug at this time and its role in therapy may evolve over time as new indications are explored by the company or pioneering clinicians (e.g., CAP, SAB?, Osteomyelitis?, UTI?, Tb? ).